The Flapping Display from Samsung is a light and breezy 0.05 millimeter OLED display. Seen at Japan's International 2008 exhibition, the manufacturer actually installed a fan nearby so you could see it flex all 4" (diagonal) of its OLED muscle. E.C. Tubb fans - your flexible wall sheet display is almost ready; it took only a half-century for engineers to catch up to your imagination. Read this excerpt from his 1958 classic The Mechanical Monarch. Against one wall a wide sheet of clear material suddenly flared with light and swirling colour. It steadied and a woman stared from the screen. A woman with long dark hair and eyes that were like twin pools of midnight beneath her heavy brows. She wore a dress of some shining black material and her full lips were red against the whiteness of her skin. Curt stared at her, savouring her remarkable beauty, and was barely conscious of the hush which settled over the restaurant. 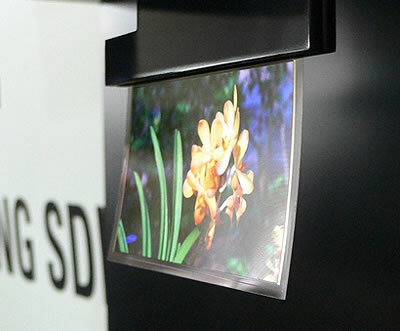 From Nikkei via Thin Is In: Samsung intros Flapping Display OLED panel .